According to a landmark 2012 report, “Rooftop Revolution,” by the Manhattan Borough President’s office, there are 2.7 million square feet of usable roof space on NYC’s public schools. These rooftops represent a vast, untapped opportunity to generate renewable electricity from solar panels. Using public school rooftops alone, and using the City University of New York’s N.Y.C. Solar Map, the report estimated that new solar installations on school rooftops could generate 169.46 megawatts of clean, renewable energy, eliminate 76,696 tons of carbon from the air each year — the equivalent of planting more than 400,000 trees – and increase NYC’s solar energy capacity by 2,500%. Several NYC Eco-Schools are already leading the rooftop revolution. In late 2011, MS442 – The Carroll Gardens School for Innovation – in Brooklyn installed about 4,200 square feet of solar photovoltaic (PV) panels on its rooftops. The system produces about 47.6 kilowatts (kW) or 152 kilowatt hours (kwh) of electricity per day. For 365 days per year, this corresponds to 55,597 kWh per year. Assuming a current electricity rate for NYC DOE of about $0.18/kWh, and according to Sunny Portal, MS442’s PV system offsets over $10,000 in electricity costs per year and has so far prevented the release of over 148,000 pounds of CO2 into the atmosphere. The Urban Assembly School for Green Careers at the Brandeis campus on the Upper West Side of Manhattan has an equally impressive 47 kw solar PV installation, installed in early 2012, that generates an average of 48,000 kwh of electricity per year, has saved close to $9,000 in electricity costs per year, and has prevented the release of over 140,000 pounds of CO2 into the atmosphere. At Regis High School in Manhattan, a 22 kw solar panel array on the school’s 22,000 square foot green roof, installed in June 2007, generates 3,730 kwh of electricity per year and provides 5% of the school’s electricity. The panels have thus far prevented the release of 40,528 pounds of carbon dioxide and generated enough energy to power 650 homes for one day. These stats are monitored through the school’s website. In 2012, Regis also replaced all of its lights with LED (light-emitting diode) fixtures, reducing electric use by more than half (and costs as well). Faculty and students have learned about vampire loads and have stepped up recycling efforts throughout the facility. At PS41 in Manhattan, a three-panel solar array lives on the school’s 15,000 square foot green roof. PS41’s panels are not grid connected but are hooked up to a battery and used for educational purposes. The battery is housed in a box, so the students can view it. An outlet mounted on the outside of the box allows for easy plug-in demonstrations of solar/wind power. Science teachers Vicki Sando and Joaquin Rodriguez integrate the panels into classroom activities with the school’s Urban Eco-Club. Students build small solar cars and wind turbine units to understand the concepts behind renewable energy. They test them, and Sando and Rodriguez discuss how renewable energy works on a larger scale, such as on wind farms and large solar installations. Thanks to a partnership with Divvy Solar, a solar crowd-funding startup, Bronx Design and Construction Academy’s solar research project – designed to prove that green roofs improve the efficiency of solar panels – was fully funded. The panels should be installed in the Spring of 2014. PS/IS 276, The Battery Park City School is Manhattan’s first green school building. The vertical 8-story building – a showcase for sustainable design and energy efficiency – was conceived by John Woelfling, a LEED AP and principal at Dattner Architects. The school features three solar PV installations, for a total of 50kw. The first is on the school’s entry canopy: a handful of panels with transparent glazing, spaced out on a platform. The second array, is on the roof and part of an outdoor classroom where the children grow tomatoes, basil, radishes and monitor the amount of energy generated by the solar panels in a weather station. The third array is the largest and in the same general area. Woelfling is currently working on three large solar school projects for the NYC Department of Education, in collaboration with the School Construction Authority. The projects are due to be completed by mid-2014. The Town School’s 2008 graduating class raised $10,000 to purchase 28 solar PV modules; these were installed in 2009 and provide 6.048kw of power for the school – enough to power both the upper and lower science classrooms, including lights and computers. In 2012, Town also installed a wind turbine – the first at a New York City school. 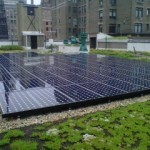 In December of 2011, a 4.84 kW solar-electric system was installed over the rooftop playground at Lycée Français de New York. The project, which includes a weather monitoring station, was funded through a combination of public and private donations. Schools have a range of options to choose from, to teach their students about renewable energy. NWF’s Cool School Challenge engages schools in practical strategies to reduce carbon dioxide (CO2) and other greenhouse gas emissions school-wide. Students build STEM skills as they learn to conduct energy audits, calculate their impact, and create an action plan to shrink their carbon footprint. An interactive carbon calculator helps to evaluate progress, graph results and cost-savings. Schools doing the Cool School Challenge can address Eco-Schools USA’s Energy and Climate Change Pathways and apply for awards through the program. Solar One’s Green Design Lab curriculum engages students in hands-on activities, uses the school building as a model for exploring topics of sustainability, and gives students the knowledge and tools to solve real-world problems. The Alliance for Climate Education offers exciting in-school assemblies that aim to inspire students to take action on climate change. The Green Schools Alliance’s (GSA’s) Green Cup Challenge engages schools in an annual energy conservation competition. GSA, in partnership with the Environmental Protection Agency, has also launched the Green Schools Renewable Energy Purchasing Consortium. The purpose of the Consortium is to accelerate the adoption of renewable energy by K-12 schools by aggregating demand and reducing administrative burdens. The Natural Resources Defense Council recently launched a “Solar Schools” initiative, aimed at establishing pilot solar school projects across the U.S. to build support for solar schools more generally. Does your school have a solar installation? If so, send me your pictures and let me know if/how you integrate your facility into your curriculum, or join our Facebook group page and post them there. If your school is interested in a solar installation, consider posting a project with our partners at Divvy Solar. Have a solar question? Drop me a line at fanoe@nwf.org.